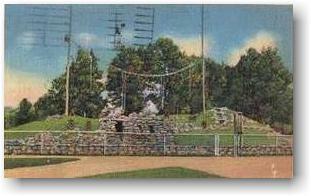 Monkey Island postcard, postmarked July 15, 1935. In 2002, the Tulsa Zoo will celebrate its 75th anniversary. Hundreds of thousands of Tulsans remember the excitement of watching the Uncle Zeb shows. For some youngsters, it was the actual thrill of being on live television that created such fond memories. 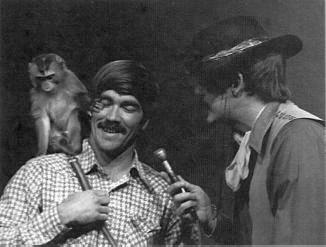 Some current and former members of the Tulsa Zoo staff who participated in the show also can recall some treasured moments of going on-air with Uncle Zeb and his guests. 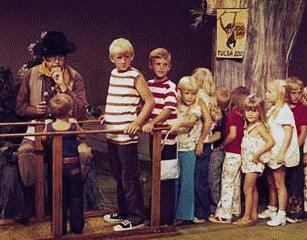 With live animals in tow, zoo keepers would appear before a live audience with the animals, of course, stealing the show. The television show ran on Channel 8 from 1969-1979 and began all over again for a new generation of viewers on TCI Cable from 1990-1997. 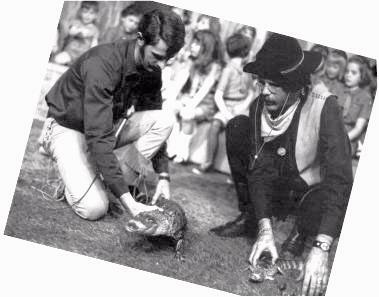 Larry recalls, "Those were the days, in the 70s, before such things as zoo uniforms and tuberculosis tests for handling animals, and there were no strict policies about which types of animals could be taken from the zoo. I believe we received the monkey from someone who had it as a pet, which, unfortunately, was a common practice.This particular monkey proceeded to land on Uncle Zeb's head and seek bathroom relief, all of which was captured on camera." "Buddy, the male chimp, went 'ape' just before we went on the air. Not only did he tear up the adjacent newsroom, but he also beat me up. We never made it on the air. When I rushed him back to Dave Zucconi's station wagon, Buddy settled down, we hugged and made up (thank goodness!). "On one trip to the show, a six-foot-long alligator climbed out the back end of a Docent's station wagon while we were stopped at a filling station. He almost made it to the highway before I caught him. On our return trip after the show, a radiator hose broke causing us to make an unscheduled pit stop. The alligator, which I had been sitting on in the back of the vehicle, climbed out of the rear window while I was tending to the radiator problem. "We once had to prevent a small child from eating pygmy goat 'pellets' that the animal had decided to deposit on live television."